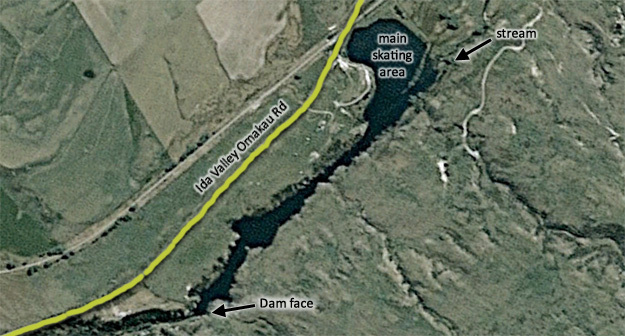 The Idaburn dam is famous for curling, but when the curlers aren’t making use of the large but shallow expanse of ice, the dam is often used by skaters. 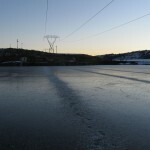 The Idaburn dam is often frozen over. The ice quality is usually not as good as that found at the Manorburn dam. Hoar frosts on the overhanging power lines often leave a trail of ice crystals in straight lines along the ice. The Idaburn dam is found by driving a few kilometers west via the main road through Oterehua in Maniototo. The reservoir is situated directly beside the road. The bulk of the reservoir is very shallow, but towards the dam itself the depth increases quickly. Idaburn dam. The liquid section to the right hand side rarely freezes, however the main basin on the left is one of the more reliable sections of ice in New Zealand. . July 24th 2010. Photo courtesy of Ryan Hellyer. The gorge heading up to the Idaburn dam face. . July 24th 2010. Photo courtesy of Ryan Hellyer. 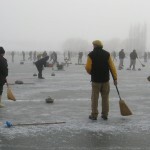 The Idaburn dam is best known for it’s famous curling bonspiels. July 2010. Photo courtesy of David Patchett. If you have any information, photos or stories relating to the Idaburn dam which you think would be suitable for this page, please send it to us, or apply to be an official contributor to the site.